Father Damien of Molokai. It is worthwhile to look for the source of such heroism. 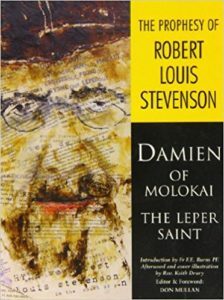 The Prophesy of Robert Louis Stevenson – Damien of Molokai – The Leper Saint (a little book company, Dublin, 2009). This book was published to commemorate the canonization of Fr Damien on 11 October 2009 and the fulfillment of Robert Louis Stevenson’s prophesy. Damien of Molokai, the leper priest, was ‘no saintly philanthropist’ according to a Rev. Hyde in 1889. Damien was, in Hyde’s words, ‘a coarse, dirty, headstrong bigot – not a pure man in his relations with women’, a man whose own leprosy was ‘due to his vices and carelessness’. Damning accusations. In a powerfully impassioned response, Robert Louis Stevenson, the author of Treasure Island, The Strange Case of Dr Jekyll and Mr Hyde and other great books, upholds Fr Damien and accuses his fellow Presbyterian of unjustly maligning a man of virtue and humanity who would one day, he prophesized, be canonized a saint. Stevenson, in this virtually unknown text, composes a powerful work of evidence-based humanitarianism, about compassion, ecumenism and reconciliation, about human failings and the importance of justice. The forward, introduction and afterword by Mullan, Burns and Drury highlight the relevance of Stevenson’s text, and the life and witness of Damien, for our times. “Children need heroes. My mother understood that. She understood that strong role models can inspire and motivate children to grow into respectful and caring citizens; citizens who try to make the world around them a better place; citizens who recognize that family extends beyond the confines of one’s home and includes the downtrodden and marginalized. That impression might be seen in the causes and concerns that Mullan subsequently dedicated his life to. Royalties to the Desmond Tutu HIV Foundation.